Search the back issues of the Baltimore Sun and 21 other Baltimore newspapers. GenealogyBank has just added 61 newspapers from 17 States. “Our teams really went all out this month. They have been working in multiple states partnering with newspapers and archives and this month they put up the equivalent of almost 22 million articles.” – said Tom Kemp, Director of Genealogy. 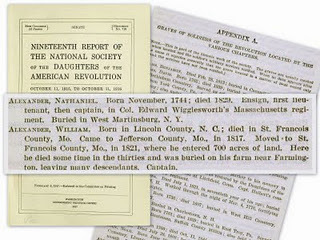 The annual reports of the DAR – Daughters of the American Revolution are in GenealogyBank. They were published annually as part of the US Serial Set. Each year the DAR published the details of the soldier’s graves that they had located the previous year. You can find them in the “Historical Documents” section of GenealogyBank. George Washington gave his farewell address September 17, 1796. The war had just ended only 13 years before. He had led the nation’s forces in the war and brought the nation together once the country was formed in 1786. George Washington gave his farewell address 17 September 1796. Joshua Hempstead (1678-1758) - I was blind but now I see. If you’re looking for Michael Jackson in the SSDI – you’ll only find him on GenealogyBank’s copy of the Social Security Death Index. Why? Because GenelaogyBank is the ONLY site that updates the SSDI every week. The War of 1812 ended 193 years ago with the US ratification of the Treaty of Ghent on 12 Feb 1815. But even before the war was over the two sides were exchanging prisoners of war. One of the problems and underlying causes of the war was British impressments of former British subjects who became naturalized US citizens. This continued as an issue when the British were not going to return former British citizens captured in the war. These were real people – and their names are clearly spelled out in early documents. Here are pages of the names of American and British POWs that were being exchanged in 1813/1814. This is a great genealogy resource – a good example of the strength of the detailed records found in GenealogyBank. Military lists; pension records; land records; and more. GenealogyBank is packed with resources. These detailed lists were easy to find in the 692 pages of this report – just type in the name – click and it takes you right to these pages. There are 1.3 Billion names in GenealogyBank – in over 221 Million documents and records. Give it a try right now and see what we have on your ancestors.